This is a really big week for birthdays: Bob Marley on 6 February (1945) [“it takes a revolution to make a solution”] and Saint Thomas More on 7 February (1478). More and more scholars agree ...the New Isle Called Utopia is a true socialist manifesto and I concur! Most importantly though, 8 February (1880) is the birthday of painter, writer, animal sanctuarist, soldier, and millinery fashion icon Franz Marc. Fabeltier (1912) is a plate from Der Blaue Reiter. 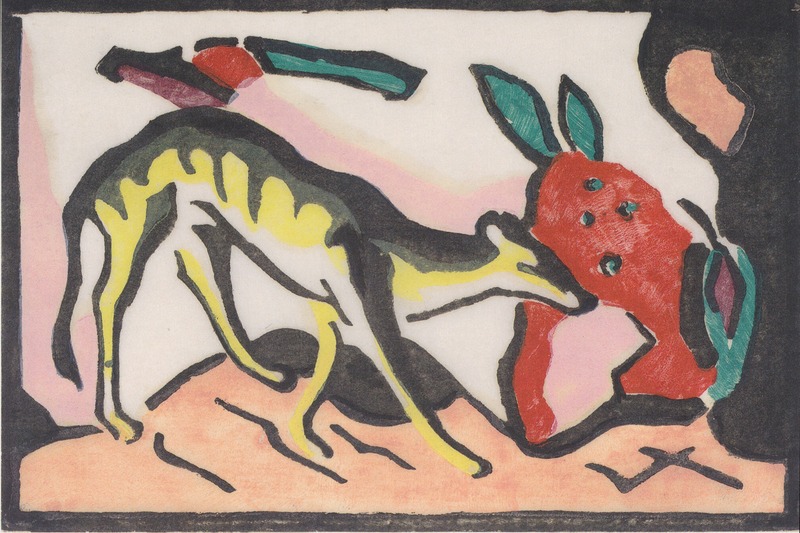 Is the image a tiny (Italian Greyhound-looking) fanciful creature by a regular-size strawberry, or a giant strawberry with a little dog, or something else? I don’t know; it’s just fun and mysterious. Marc made a few illustrations like this called various iterations of Fabeltier but like gargoyles the animals resemble dogs, horses, lions…I especially like this one but they are all fantastic. © Jean Marie Carey 2006-2019.